Kulothunga Chola III was the last recognised mighty Chola monarch who delayed the process of collapse of dynasty for about a generation. He ruled the great Chola empire which was once ruled by greatest ever rulers of Indian subcontinent like Karikala Chola, Vijayalaya Chola I, Aditya Chola I, Rajaraja Chola I, Rajadhiraja Chola I, Rajendra Chola I, Rajendra Chola II, Kulothunga Chola etc. Kulothunga Chola III succeeded Rajadhiraja Chola II and ruled between 1178-1218 A.D. His chief queen was Bhuvanamuludaiyal. In his reign he waged wars on Pandyas, Hoysalas, Sinhalas of Ceylon, Chodas of Velanadu etc. Before him, the influence of central administration of Cholas on outlying parts was decreasing rapidly. After his coronation as king of Chola empire, he brought order to the internal administration and strengthened it. 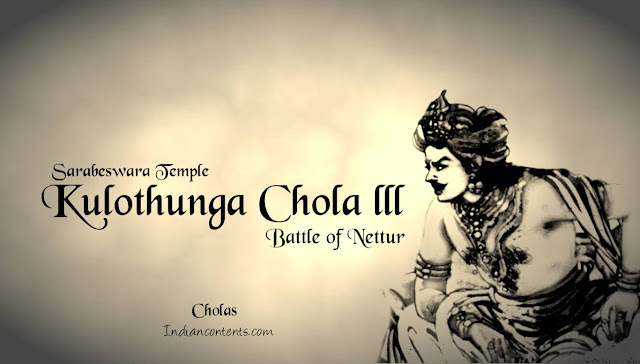 In his reign, Kulothunga Chola III fought in 3 wars with Pandyas (1182 A.D.,1188 A.D. and 1205 A.D.). During early time of his rule, there was a civil war going on in Pandyan country. Two pandyan princes were fighting for the crown. During Rajadhiraja Chola II's reign Vira Pandya somehow managed to capture the Pandyan throne. Vikrama pandya was eager to wage a war on Vira Pandya and capture the throne. The Sinhala king Parakramabahu joined hands with Vira Pandya and supported him as the king of Pandyan empire. Vikrama Pandya sought the help of Kulothunga Chola III in defeating Vira Pandya to become the king of Pandyan empire. This led to invasion of Pandyan empire by Kulothunga Chola III. The Cholas and Vikrama Pandya on one side and Vira Pandya and Sinhala forces on other. The Cholas very easily defeated combined forces of Pandyas and Sinhalas. Vira Pandya was driven in to exile and Vikrama Pandya was made the king of Pandyan empire by Kulothunga Chola III. This was the first war with Pandyas for Kulothunga III which took place in 1182 A.D.
Vira Pandya was waiting in exile for revenge and for the Pandyan crown. He secretly built a vast army aided by his allies from Ceylon. In the year 1188-89 A.D., Vira Pandya invaded the Pandyan kingdom and tried to reclaim his throne. But his attempt was stopped by Kulothunga Chola III on the battlefield of Nettur. Vira Pandya tried very hard to defeat Kulothunga Chola III but due to increased strength of Chola army. This war which took place in 1188 A.D. between Cholas and Vira Pandya is referred as Battle Of Nettur. After Vikrama Pandya, Jatavarman Kulasekhara Pandya became king of Pandyan kingdom in 1190 A.D. He rebelled against the Kulothunga Chola III's involvement in internal affairs of his kingdom. In 1205, Kulothunga III attacked Pandyan country and defeated Kulasekhara Pandyan. During Kulothunga III's reign, the king of Hoysala was Veera Ballala II. He was an ambitious king and tried to extend his boundaries beyond his limits i.e. Kaveri-Thungabadra basin. In 1186 A.D., Kulothunga Chola III noticed the growing power of Hoysala king Veera Ballala II. A war took place between Kulothunga III and Ballala II around 1187-88 A.D. in which Veera Ballala II was very badly defeated by Kulothunga III. After this war, there were friendly relations between Cholas and Hoyasalas. Kulothunga Chola III was a great builder and among his many well known constructions, the construction of Sarabeswara or Kampahareswara temple at Tribhuvanam near Kumbakonam was prominent. It is considered as a great specimen of Dravidian architecture. The design of this temple resembles Brihadeeswara temple in Thanjavur. This temple consists of Ramayana reliefs on its walls. He also renovated many temples whiich were constructed by his ancestors. He erected a Mukha-mandapa of Sabhapati, the gopura of goddess Girindraja (Sivakami) and the verandah around the enlosure in the Siva temple of Chidambaram. He also renovated Shiva temples at Tiruvidaimarudur, Thiruvarur, Ekambareswarar temple at Kanchipuram, Halahalasya temple at Madurai etc. During the last phase of his reign, Kulothunga Chola III had to face a defeat in the hands of Pandyan king Maravarman Sundara Pandya. Due to aging and lack of support from his feudatories, Kulothunga Chola III lost to Pandyas around 1216 A.D. Kulothunga III and his son Rajaraja Chola III were driven in to exile. After this Kulothunga III was succeeded by Rajaraja Chola III. By that time due to rising Pandyan power, the Chola empire was much reduced in size as well as influence.